It turns out the world’s coolest gas station in Asmara was not the only infrastructure the Italians left behind in Eritrea. Then again, Eritrea comes with a long piece of Red Sea coastline and a capital city at an elevation of 7,628 ft, so it’s perhaps not entirely peculiar to find a breathtaking stretch of highway connecting said coastline with said capital city. This is the P–1 highway which connects the port city of Massawa with the highland capital Asmara. Google Maps can give you driving directions, and yes, the route looks like a tapeworm on acid. The picture was taken in the late 1940s by John Brantley, an American serviceman who was stationed at U.S. Army Kagnew Station. His period photos, recently uploaded to Flickr, are quite fascinating. Army life in ’40s Asmara was apparently a young man’s delight! 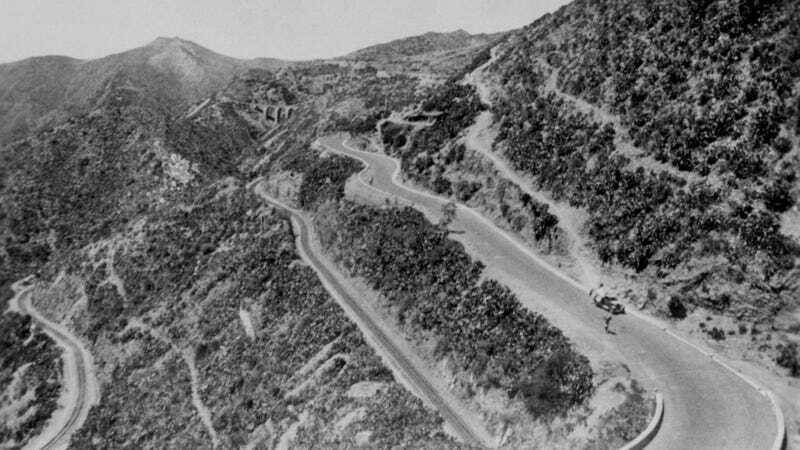 Brantley’s photos show a racetrack with an actual race for single seaters, a guy chilling with his very cool Richard Caleal-designed 1949 Ford, and several angles of that road which cries out for a car that handles like a dream in the Eritrean clouds. Single-seater race in late ’40s Asmara, the capital of Eritrea. This guy won the race. U.S. serviceman John O. Philpot with 1949 Ford in Asmara. Mountain road between Asmara and Massawa. Meeting the locals in a Jeep.